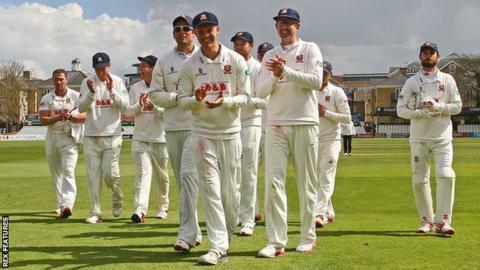 Essex are already strong candidates for Championship promotion, according to Northants head coach David Ripley. They defeated Ripley's side by an innings and 92 runs on Wednesday. "I would suggest that Essex will be pretty near the top of the league at the end of this season," he said. "They've got two guys in Ryan ten Doeschate and Ravi Bopara that have often been at the IPL and the England captain (Alastair Cook for first four games), so it's been a tough gig." Essex have won two and drawn the other in their opening three Division Two fixtures. Ripley told BBC Radio Northampton: "They've also got (David) Masters back from injury for this game so they look very strong. "We didn't measure ourselves well enough against them which is disappointing. We're better than we showed in this match and when we play these guys again we need to be a lot better." Northants are currently bottom of the table after two matches, with their opener against Sussex abandoned because of bad weather. Ripley's side reached 481-7 in their first innings at Wantage Road against Sussex, with Ben Duckett making an unbeaten 282 before the match was called off. "Sussex are one of the favourites as well and we can't lose sight of when we played them in our first game and acquitted ourselves very well," he said. "We got a lot of pats on the back as to how well we batted and the weather robbed us of a chance to win. "We haven't got to panic a great deal. I'm looking forward to the games coming thick and fast because now we can feel like we can get into a rhythm." Meanwhile, Essex paceman Matt Quinn will be out for two to four weeks after injuring his side during a second XI game versus Middlesex last week.